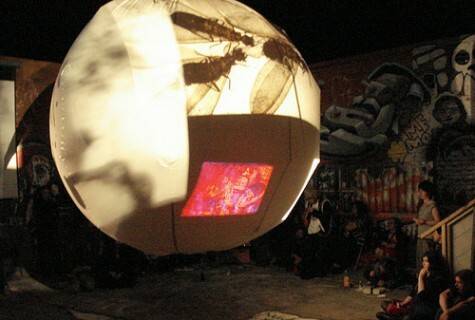 SOOB and Otherfilm invite you to explode your mind and surrender your senses at Beamathon. They will be duly returned to you in expanded condition after the show. 7:30pm-8:00pm: Illuminate your own murky depths with Point Source, an interactive re-enactment of Tony Hill’s 1975 expanded cinema event using a single powerful bulb to cast fantastic shadows through intricate, semi-translucent objects. ‘Be your own screen’ at Smock Party, a reflective dress-up re-actualisation of Man Ray’s 1930 White Ball, involving handmade celluloid abstraction and umm…smocks. Don’t panic, but be very afraid of Return of the Projector Spawn, a mutant assemblage of razor sharp teeth, hand processed film, clouds, grasses, and trees by Sally Golding. 8:00pm-9:00pm: Acquiesce to the analogue, with the surreal program of lustrous 16mm film from the 60s, 70s and 80s, including Lenica’s Labirynt – dark collage as only Czechs know how, as a bowlerhatted visitor encounters a city filled with strange and hostile creatures; Frank Mouris’ endearingly hyperactive cut-out animated auto-bio Frank Film; Paul Sharits’ film-fetish-film Inferential Current; OFF alumna Arthur and Corinne Cantrill’s mind-bendingly beautiful colour separation dance-of-shadows, At Black Range; and Hamfat Assar by Larry Jordan, where a tightrope across an engraved seascape scene provides the backdrop for a fantastic underworld. 9:00pm-9:30pm Ray Off: Intensely expressive/melodic/bent improvisation which stands at, or somewhere near, the centre of the new musical exciting vibe coming outta New Zealand’s southernmost city, Dunedin. Rich lyrical improv, sculpted, Morricone-esque story-scapes, minimal beauty therapy and more. 9:30pm-10:00pm flyingscribble:Gray and Louise are siamese. We make the sweet stuff together. First playing together in LOVEPACK (Brisbane 2000-2002) Gray (mostly rhythm) and Louise (mostly melody) we have left home, gone astray and found our way back to each other’s music pouches. We sit on a little boat together rocking on sound waves that come from the pits of somewhere deep down the waters – our music got bell soul and wood worms. Tina Blakeney and Danni Zuvela: Abandon yourself to the aura, at Tina Blakeney and Danni Zuvela’s concert of oily wraiths, ghostly flames, shadowy puppetry and line abstractions, performed on an unsuspecting bevy of overhead projectors. 10:15pm-10:45pm Sue Harding: Shake your switched-on heads in synchronised disbelief as legendary Wagga Wagga artist Sue Harding (in Brisbane for the first time since 1976) feeds specially composed text/scores into four amplified Dot Matrix printers, reanimating these arcane devices and producing an utterly unique machine music of buzzes, whirrs and beats. 10:45pm-11:15pm Castings: Stumble about in the blissful reverie of gleeful clattering abstraction, ecstatic noisescapes, and unhinged percussive momentum generated by Sydney free/drone ensemble Castings, making their Brisbane debut at just the right moment. 11:15pm-midnight Gasp in stunned amazement at the grand inauguration of EEE (ear eye ensemble), an indeterminate audiovisual orchestra that spectacularly collapses the whole history of projected sound and image into 45 minutes of violent sensory meditation, utilising radical aural diffusion and a massive hovering blimp-screen conceived and created by art/tech visionary, Watthaus. Submit your sensitive self to spirited somatic stimulation, and frolic some.